Q: I'm first time here. Where I should start? Q: Is it necessary to have an account here? Q: What should I do if I did not receive confirmation message? Q: I cannot log into my account, what should I do? Q: I have difficulties when I logged in - every time I click on any link it kicks me back to main page! What's going on? Q: I have not got my free songs for registration, where I can get them? Q: How do I change my login email address or password? Q: Is it safe to provide you personal information? Q: I want to unsubscribe of your newsletters? Q: How can I make payment for mp3 downloads? Q: What payment methods are available on Mp3million? Q: I'm not sure that my payment has been proceeded, how can I check it? Q: How much does it cost to purchase music at Mp3million.com? Are there any hidden/monthly fees? Q: Do you have discounts, bonuses or special offers? Q: Do you have subscription fees? Q: How can I try song before I will buy it? Q: I cannot listen to preview on the web site, what should I do? Q: How can I purchase music? Q: How to download purchased music? Q: I have bought many songs some time ago, but now there are nothing in my download section! What's wrong? Q: Is there album cover/artwork included when I purchase the downloads? Q: I want to buy release which coming soon, how do I know when it will be available? Q: I have downloaded tracks to my computer, but can not find them! Q: What is the Archive and where is it located? Q: How can I download or transfer tracks to my mobile phone/mp3 player (not iPod/iPhone)? Q: I have downloaded music from you and it won't play on my MP3 player or my phone! Q: If I decide to close my account with you, will I be able to keep all purchased and downloaded music? Q: If your web site is legal, why your prices are so low? Q: I have not found answer to my question, what should I do? Q: I want to make a gift to my friend for Christmas. Do you have gift cards? How does gift card work? Why am I having troubles with gift card purchasing? How will I know about the card activation? I have entered wrong recipient's email, what should I do? I purchased $30 card, but my balance debited with another amount, why? I changed my mind about the gift card, but it has been sent already. Can I request a refund? I received your gift card, what should I do with it? A: Welcome! In order to use all services you should setup an account with us. Start by click on Create an account link in top of the main page. Enter your valid email address, because after registering confirmation message would be sent there and password. Note that password is case sensitive and should be not shorter than 6 characters. Security question is special option which help us to avoid random registrations. Just enter the sum which would be posted on picture near the field. Read carefully and agree to Terms and Conditions. Click on "create an account" button to finish this procedure. A: Yes, you will not be able to use our service without registration. Also it is required for personalization of "Shopping Cart" and "Account", for getting in touch with support and obtaining bonuses and discounts. Registration is absolutely free and note: you will receive bonus ($0.20) to get two free songs upon registration in order to try our service. A: Please check your spam box if you false to find it there write to our support box. Visit our site, Account settings section. Check the spelling of entered email address. If it is ok, you can try to send confirmation email one more time using option "send confirmation email again" in bottom of the page. 1. Within Internet Explorer, click the "Tools" menu and choose "Internet Options". 2. Click the tab labeled "Privacy". 3. Click the button labeled "Advanced". 4. Check the option labeled "Override automatic cookie handling". To enable cookies: Set "First-party Cookies" (and "Third-party Cookies, if you wish) to "Accept". Set "First-party Cookies" (and "Third-party Cookies, if you wish) to "Prompt". 5. Click "OK" to save changes and close the dialog box. Within Firefox, click the "Tools" menu, then click "Options". Click the "Firefox" menu, then click "Preferences". 2. In the left-hand column, click the icon labeled "Privacy". 3. Click "Cookies," then click the option labeled "Allow sites to set cookies. 4. Click "OK" to save changes and close the dialog box. 1. Within Safari, click the "Safari" menu and choose "Preferences". 2. Click the icon labeled "Security". Set the option labeled "Accept Cookies" to "Always". 3. Click "OK" to save changes and close the dialog box. 1. Within Opera, click the "File" menu and choose "Preferences". 2. In the left-hand column, select "Privacy". 3. Select the option labeled "Enable cookies". A: Please find our confirmation email message, there you will find a link which activate registration bonus. If you have not received confirmation message from us, please try to find it in your spam box or request it one more time in your Account section on site. Note: creating more than one account is prohibited. If such activity will be detected we will have to terminate your accounts and inform your ISP and local authorities of such fraudulent activity. A: For this purpose you have to log into your account and visit your personal account page. There you will be able to change any personal info you have. Please do not forget to save changes by clicking on "Save changes" button into each fixed section. A: Administration of www.mp3million.com guarantee that all personal information you provide will never be disclosed to the 3rd parties without your written permission. A: Visit your Account section and find newsletters block. Select or unselect services you do not want to use. A: We have special option allows you delete your account if you do not want to use our services anymore. It posted in Account section in down of the page. A: To update your balance please visit Add money page. Select payment method, deposit amount then press "submit" button. You will be transferred to payment page where you should follow instruction and fill all necessary fields with correct information. Depending on the sum you pay and the method of payment we offer various bonuses. If you have questions - please feel free to contact our support@mp3million.com. Please note that the minimum one-time payment is $15. All prices on our web site are in USD currency. A: We accept the following credit cards: Visa, Mastercard, Maestro. A: You can visit your balance page on our site and check for it, also you will get a message to your registration email address with notify that you have been successfully credited your account on Mp3million.com. Payments history and their current status available in your balance page. 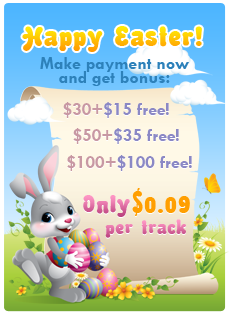 A: The regular price for one track on our web site is $0.09. Prices are in USD with all TAXes included. We have not any extra fees. You pay for purchased music ONLY. A: No, we have not time limitations/restrictions on our web site. All deposited money will be available until you spent them. Keep an eye on updates of our bonus system! A: Mp3million.com is not based on a subscription service. Our customers pay only for songs they have purchased, at the point of purchase. A: We offer 60 seconds preview for any song available on Mp3million.com and of course it's free. To get started listening to preview visit album page and click on play button (triangle icon) beyond song you want to hear. Previews is a 60 sec long part of one track, taken after 20 sec of original song. A: No, previews have limited 64kbps quality because of security reasons, of course it is not the actual quality of the music tracks available for download on our web site. A: Please make sure that you have latest Flash Player for your web browser installed. A: On release page you select songs which you want to buy and click on button 'Buy now' to get them available for downloading at the moment or click on "Add to cart" button to put songs in cart, to purchase them later. In your shopping cart you will find songs posted in releases and to purchase all of them from one release you can click on "purchase album" button. To list tracks included to release click on tick near cover of release. A: A zip file is archive (compressed folder) which has several files (or entire album) inside. It allows you to download several tracks at the one time. You will need to 'unzip' this file and extract files from archive before using them in MP3 player or mobile phone. A: We neither set passwords nor have corrupted files or archives on our site. All this can be a result of interruptions in your Internet connection. Please try to re-download this track/album. To avoid problems like this we suggest to use download managers soft (e.g. Reget; Reget Deluxe; Go!Zilla; FlashGet; GetRight). If you continue experience difficulties with downloaded files, please send message to our support team with detailed description including what's wrong, album and artist name, link to the release page. Note: all purchased music can be re-downloaded multiple times from your Downloads section during 6 months after purchasing or as long as you do not delete it from there. A: Purchased files stay available for downloading for 6 months after purchasing, then songs deletes automatically because of our security system. Our users have 6 months to download what they purchased. A: You should write about it to our customer support with detailed explanation what song in what album has problems. After we check the issue and validate your complaint, we will return the appropriate balance to your account. We will also try to do everything within our power to replace the low-quality track so you can download it again. Note: some classic audio has been recorded from vinyl and may have characteristics distinctive to the medium that cannot be prevented. In such cases, please note that the original source cannot be improved. A: Almost all releases on our site contains artwork. But downloads from the older part of our catalogue may not have it. However, we are working to deliver artwork with all MP3 downloads. Single windows media files do not include artwork because of technical limitations. A: For this purpose we have special section called 'Coming Soon'. There you just find release you want to buy, add it to your bookmarks on site and after it will available for purchasing - you will be noted by cross sign '+' near bookmarks link in top of the site. A: Tracks that you have downloaded from Mp3million.com usually be saved in one of three places: My Music, My Downloads or your Desktop. If you failed to find downloads, first of all make sure that you have really downloaded files. Then try to use searching system in your operating system - search for artist/album name. The archive is an option which allows you to keep purchased tracks safe and clear the downloads section from the old purchased items. Once you sent purchased songs to the archive they stay available and ready to be recovered for downloading. 1. Sign in and visit your download section, then select tracks you want to send to the archive. 2. Click «Send to Archive» button in the bottom of the page. 1. Sign in and go to the Balance page. You will find «Tracks archived» stats there and the link next to the number of archived tracks. Click on the link. 2. Here are all the archived tracks you have. Please select tracks you want to recover and click the «Restore» button in the bottom of the list. A: First of all you have to download purchased music to your computer and extract it from archive if you download in Zip file. After that you need to download iTunes and install it due to instructions. Then run iTunes. a) To import an individual mp3 file, choose File > Add File to Library, and then locate the music file you want added to your library. To automatically update your iPod/iPhone with all the songs and playlists in your library, select "Sync music" and then select "All songs and playlists". iTunes loads the songs and playlists in your iTunes library onto your iPod, and deletes songs from your iPod/iPhone that aren't in your library. To automatically update your iPod/iPhone with only certain playlists, select "Sync music" and "Selected playlists," and then select the playlists you want synchronized. A: First of all you should purchase tracks and download to your computer. Then procedure varies depending on the type, model of your device, so you may need to consult user guide or manual of your device for detailed instructions and steps. If you have music library on your computer which synchronizes with device, you should add downloaded mp3s from Mp3million.com to your music library first and then sync with device. Note: downloading to computer is not necessary for some devices which have their own browser and Internet access. A: Please make sure you have successfully downloaded tracks (without interruption which could cause the problems with files) to your computer and if you used zip file download method, you have extract mp3 files from zip archives before you attempt to play them on your device. If you instead have difficulties, please contact our support team with all details you have, including download you are having problem with and device you want to use. A: Yes, all purchased and downloaded music can be burned onto CD as long as it is for your personal use. Please use any available CD burning software (e.g. Nero, Windows Media Player). A: Yes, all purchased and downloaded music will be available. You will be able to listen to it for a lifetime as longs as you keep it in a safe place. A: If you are dissatisfied with the quality of our services, you may request a refund, which will be considered by administration of Site. For this purpose you should direct the application to the email address: refund@mp3million.com with detailed explanation of the reason why refund should be made to you. Refunds can be initiated for the following reasons: double and/or accidental deposit; corrupt content on our web site; unauthorized payments. After the refund your account will be blocked and in the future you will not be able to register on Mp3million.com web site and use our services ever again. NOTE: The Site will not issue a refund if you made a deposit more than 45 days ago and only purchased 1 song/album. A: Unfortunately in this case refund is not possible. We strongly recommend our members to calculate the approximate sum of purchases prior to making a deposit, please feel free to use shopping cart facility. A: Yes, the activity of Mp3million.com is carried out according to the legislation of the license agreement # 67/17M-10 of the Rightholders Federation for Collective Copyright Management of Works Used Interactively (NP "FAIR"). Service www.Mp3million.com pays full-scale author's royalties to owners of pieces of music, trademarks, names, slogans and other copyright objects used on the site. Any further distribution, resale or broadcasting is prohibited. A: Our Company is registered outside US area to minimize the taxation. Also, we can offer such low prices due to guaranteed bulk purchases (minimum deposit on our web site is 15 USD). A: Yes, it is absolutely safe. Paying for your order with credit card over the internet is done via secure SSL-connection, established between our server and the server of Processing Company. Https protocol that we use makes this process completely safe for you. Afterwards your payment data transfers through closed bank networks with highest level of security. Processing of the received confidential data of the client (Requisites of a card, registration data etc.) is done in the Processing Center. This way, even the seller, can't get hold of the clients personal and bank account information. We use protocol SSL 3.0, server certificate (128 bit), issued by GeoTrust company - recognized by the center of digital certificates, to prevent unauthorized access to the information while its being transferred from the client to our server. A: Please write a letter to support@mp3million.com or use Mailbox feature. A: Yes, you are welcome to use our Gift Card option. You can find it in the Add money section. Q: How does gift card work? A: Firstly you should choose the gift card with the following prepaid amounts: $30, $50 and $100. Please note that all prices are presented in US dollar currency. Then fill the special form with the data: recipient's email, your name, short greetings, day of delivery. After completing the form you will see the amount, which will be subtracted from your current balance at Mp3million.com. At the end please check all entered data and click on "Send Gift Card" button to complete the purchase. As a result you will be provided with a short report to your email address containing the gift card details (don't forget to check the spam folder). Q: Why am I having troubles with gift card purchasing? Visit Add money section to top up your balance now. Q: How will I know about the card activation? A: You will receive a short report in your Balance page of our website with the email address for which the gift card was activated. Q: I have entered wrong recipient's email, what should I do? A: If the gift card is not activated, our Support will help you to resolve the issue and redirect the message to the proper email address, just let us know. Q: I purchased $30 card, but my balance debited with another amount, why? A: Please note that all payments on our website are calculated in United States Dollars. You can see GBP or EUR currencies in the interface but they are calculated according to the current exchange rates but in fact credit and debit occurring in USD. So if you purchase $30 gift card with $15 bonus, your account will be debited with $45 USD or similar value in EUR or GBP. This amount will be subtracted from your current balance on Mp3million.com, your card/PayPal/bank account is not required. Q: I changed my mind about the gift card, but it has been sent already. Can I request a refund? A: If the gift card has not been activated, you will be able to activate it back to your account. Visit your Balance page to check its status. For gift card activating you will need to copy the code from the confirmation message with the gift card details and use it in the "Gift Card & Pin code" section of the Add money page. If the gift has been already activated, there is no way to refund it back to your account. Q: I received your gift card, what should I do with it? A: You need to redeem it on our website. Sign in to your account or create the new one and visit Add money section to top up your balance using the code received in the message. Select "Redeem Gift card & PIN Code" payment method, put the code in the required field and enter your mobile phone number (it's necessary to protect from unauthorized transactions). Your account will be credited immediately with the card amount + extra bonus. Enjoy your new purchases with Mp3million.com!